The What: With finished installations now in Canada, Aveo Systems, Inc. has expanded availability throughout North America of its tabletop control appliance, Mira Connect, and cloud management platform, Mira Portal. Mira Connect’s touch screen interface makes it easy to dial calls, adjust audio settings, manage projectors and displays, and control the room, without the cost and complexity of custom programming. The platform allows integrators to easily install controllers in less time and efficiently deliver remote management services, while reducing system costs and complexity. The What Else: The room-based Mira Connect controls collaboration equipment and is the only control system required in a room. It is designed to work with collaboration systems ranging from room reinforcement and microphones to audio and video conferencing. 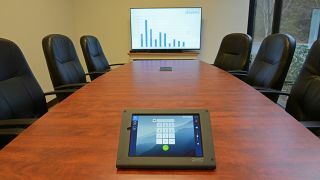 The touchscreen interface can initiate audio and video calls, control displays and projectors, and manage the audio sources in the room. Custom graphics can be used with the touchscreen, incorporating a client’s logo, background image, and custom colors.